Bon Jour! 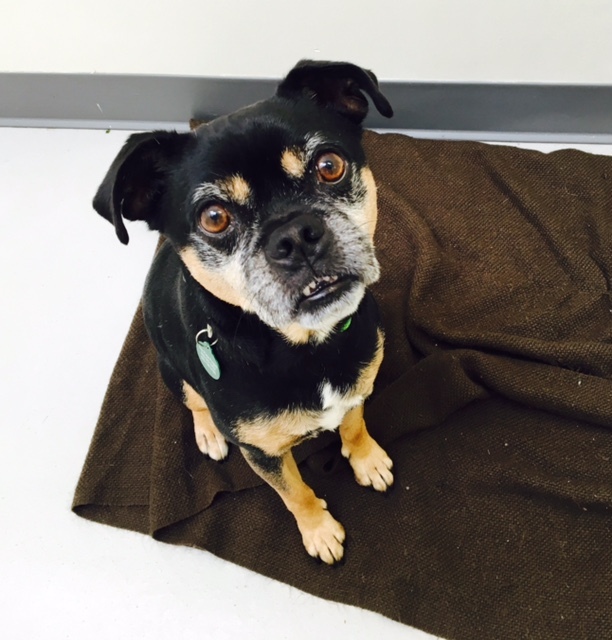 My name is Pierre and I am the most handsome 7 year old, 21 lb Pug/Terrier mix you have ever met! I am fun, loveable, and affectionate with a cute under bite face too. I enjoy being around people of all ages and I especially love to hang out and play with kids! I grew up with them all my life and they know just how to have fun and be cuddly. Just what I like! I like playing with other pups at times, especially the calmer ones like me, as puppy energy is just a little too overwhelming. Cats can join the party too! I am very smart and am a quick learner, especially with some special cheese and yummy baguettes as my reward! They say that Paris holds the key to your heart, but I must disagree–I think it’s ME! Fill out an application today, so we can meet. I come to you neutered, vaccinated, and micro-chipped with an adoption fee of $300. Chao!